Is giving away a Christmas gift to one of you!!!! $40 credit to FIVE MONKEY FABRICS, your gift will arrive before Christmas, you can put it under the tree for yourself! Notice the price crossed out? EVERYTHING ON HER SHOP IS ON SALE!!! SEE, A GIFT FOR EVERYONE! tell us what you would get if you won? 2. Become a follower here, or let us know you already are. 3. Tell us what you hope to get for Christmas! I love the Merry Little Christmas Bundle! I am making a quilt in very neutral colors and do not have a backing for it so that would be my first choice. Thank you for such a generous giveaway. I have a new rotary cutter on my Christmas wish list. I'm not hoping for anything in particular, but some $$ to spend on quilty things would be great. Your giveaway looks great! Thanks! of course i'm a follower already! I am loving the Secret Garden by Sandi Henderson!! all i want for christmas is a camera! It is a toss up between "getting it all done" and "sleep". I don't know which one I want more!! I am really hoping that I will find some quilting supplies under the tree. Maybe I should get my Husband to read this. I love the Secret Garden Coral Bundle, thanks. I would love a quilter's ironing board. Thanks for hosting the giveaway, Megan and Heather! I get a bunch of fat quarters. I think I would get some fabrics by Thomas Knauer, they were pretty awesome. Also, there's a fat qtr. bundle of Promenade that looked amazing. I'd really have to browse again, my eyes are done for the day after that blog hop. I've been begging shamelessly for an Ipad. Well, here it will be Chanukah and I wouldn't mind winning this giveaway! I have most of what I need and will be happy with whatever anyone gives me. I like the Bella Flora half yards. I love the Scribble Lime bundle, that needs to be turned into a new bag! I love Bella Flora in Brown this is then first time I've seen that fabric, but I'd get some of that! What I want for Christmas is more needles for my machine! I only have one left after all this Christmas sewing. I would get the Sketch Bundle first! I hope Sants leaves me an IPad! Hi! I am from Bulgaria and I am a follower:) I really, really like the Doohickey Designs bundle... and like the Etsy-shop too:)Have a blessed Christmas! I hope to get some flannel pajamas or a flannel nightie. It's cold here in Oregon right now! SO many beautiful fabrics! I like the Secret Garden FQ bundle, and the Pear Tree FQ bundle. Talk about a treat to win a store credit, whew! I would get a FQ bundle of Lark and some yardage of the Kasbah prints too. :) Thanks for the fun giveaway! I hope to get some fabric gift cards or a new iron for Christmas. Actually anything sewing and quilting related would make me very happy! I am loving the colors of the Mountain Majesty bundle! I think I would snag one of those! Oh, you KNOW I want some fabric gift cards!! 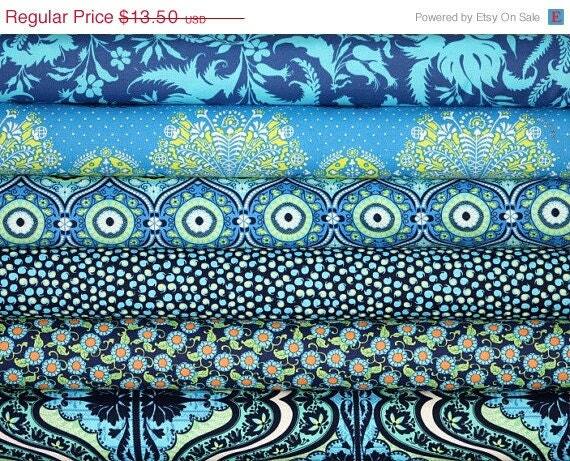 I'd get the "Secret Garden" bundle by Sandi Henderson for Michael Miller fabrics! I hope to get obedient children!! so much to choose from! Maybe some LARK fabric? So pretty! I want the Fox Trails bundle. I would love a snowless Christmas as my gift. So far, so good. Secret Garden Fat Quarters are calling my name - love all the colorways! I can't decide what I want for Christmas, but I would love to have a kindle! I just opened the page and saw what I would get...the pear tree. And for christmas, I would really want gift cards to buy fabric. Sad, but true. I really like the Pear Tree green bundle, thanks for a great giveaway! I hope to get some great fabric for Christmas....can never have enough. Thanks! I'd buy 3 yards of AMy Butler's Lark Treasure Box in Ocean to make a fabulous summer dress! Thanks for the giveaway! I hope to get at least one patchwork book for Christmas! I'd get some Lark. The colours are gorgeous. I'm hoping for a book reader. Please Santa. Hi! Thank you for a great give away and telling us about 'Five Monkey Fabrics'! I can't choose ... I was there admiring all they fabrics and then added them to my etsy circle! I hope to get FABRICS! Those Doohickey fabrics look like fun! This follower thanks you for all the opportunites to win great prizes. I'm a follower - thanks for all the chances to win! I'm not sure what I'd get, maybe some of the different colors of sketch, or some Secret Garden? So much to choose from! Great patterns and color palettes! what do I hope for christmas? A few days with friends at the beach and the kiddo at the grandparents. Happy family day together...and surprises! I think I'd have to buy the Fox Trails line. It's so, so cute! I'm hoping to get a couple of gift cards for Christmas...so I can buy more fabric!! I'd love to buy some Taza, or Secret Garden...wow, $40 would go a long way with that sale...Thank you so much for a chance to win! It would be so much fun to choose! My list would include Pear Tree, Bella Flora, and Scribble. Thanks for the chance. We've started remodeling our kitchen so that will be my Christmas gift. It won't be completely finished by Christmas, but I'm excited just the same. I would probably put a little extra $ with the $40 and get one of those yard bundles. Secret Garden or Pear Tree would probably be my pick. I would get LARK, by Amy Butler, but truly all the fabrics are fabulous. I'm getting a trip to NY with my family, who wants more? There are so many great fabrics! It will be hard to choose. I would pick Secret Garden by Sandi Henderson and LARK, Amy Butler, such pretty fabric! Love Lark, Amy Butler! The colors are perfect for what I want to start next. My wishlist has been more fabric and an accuquilt! I'd put together my own Taza bundle. I love that fabric!!! I'm not really hoping for any presents since my laptop died a few days ago and my husband rushed out to Best Buy to get me a new one...what a guy!!! I have 3 kids ages 5 and under, so I'm just hoping they have a great day!!! If I won I would buy a bundle of Joel Newberry. So beautiful. I love the oranges! Great giveaway! I would get some Pear Tree yardage. I am getting a new sewing machine!!!!! I am so excited. I've been sewing on a Singer that stopped doing any zig-zag stitches so years. Yeah!! 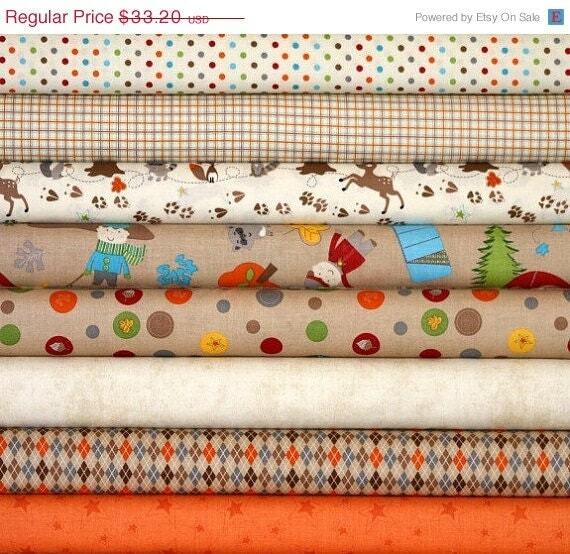 Five Monkeys have some gorgeous fabric, I would choose the Lark half yard bundle in Dreamer Palette. - I love Amy Butler's fabrics but haven't yet indulged in Lark. Thanks for a lovely giveaway. I really like Pear Tree - very nice line of fabric. For Christmas I'm hoping to get some fabric & hopefully a crafting/quilting book that I've been dropping hints about. Thanks again for the giveaway. I'm hoping to get a crate and barrel gift card this Christmas! There are just too many little things that I keep noticing are missing from my kitchen! I'm lame and I'm hoping to get a Shark Steam mop for christmas! haha! What a cute shop! The name is great :) I really love the Merry Little Christmas bundle. I am a follower and have you on my blogroll too! What I want for Christmas is for my daughter to pass all her university courses - this was her first semester and first time away from home and I know it's been hard for her. I think I need to get some Pear Tree. A bundle would be nice. I would love some fabric for Christmas. cute indeed! I love all the colors in the Sketch Bundle. Really and Truly, what I want for christmas is some rest and health and togetherness for my loved ones! Its hard to say but i think i would go with fox trails for my new little baby boy. I was hoping to get a silhouette cameo for christmas. but I found a good deal on the cricut personal cutter with gypsy. So thats what i got. I am (happily) a follower...LOL...Thanks again for the awesome opportunity! Honestly I am hoping my SIL (knit) or my daughter (crocheted) some new dish clothes for my kitchen...LOL...Thanks! For Christmas I want a handful of books and some fabric (we're doing a small Christmas this year). If I wasn't thinking of financial constraints, though, I would want a new sewing machine, or a housekeeper, or a really fun piece of jewelry! I love Secret Garden in blues...perfect for a quilt I'm working on now! I hope to get some new quilt books for Christmas- always looking for inspiration! It's a really hard choice, but I think I might go for Secret Garden in Khaki or one of the bundles of fabric from the Amy Butler Lark collection. All of them are so beautiful! I am a follower. Thank you for the giveaway. I like The Merry Little Christmas Bundle. So pretty! I'd like to get some fabric for Christmas. Thank you for the generous giveaway. Happy Holidays! I really like the Pear Tree Blue Fabric Bundle, Thomas Knauer for Andover Fabrics, 7 Half-Yards. Thanks for the opportunity to enter your great giveaway! For Christmas I hope to get some fabric that I need to finish up a quilt I'm working on. For Christmas, I'd like a brand new Bernina, but I'm dreaming! Really love the Merry Little Christmas bundle. I don't have very much Christmas fabric. Always promise myself to stock up after Christmas but then it's past and I don't feel like Christmas anymore. Thanks. I'd get me some Secret Garden, I think - gorgeous stuff!! Last year Santa brought me a new Husqvarna sewing machine. This year I just want more time to sew. And for Christmas? I want one of those electric rotary blade sharpeners - really bad!! You hear me, Santa?? cute cute shop! 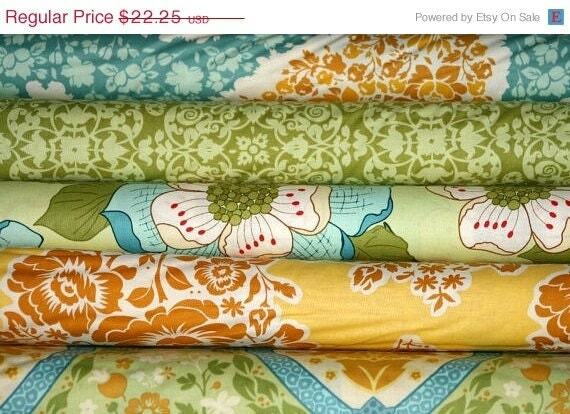 Love the pear tree fabric bundles - not sure which colorway I love best - thanks for the heads up about the sale! I would buy amy butler's lark! I'd love to get the Secret Garden Coral Bundle by Sandi Henderson for Michael Miller it would make some great Valentines goodies. I got an early xmas gift. I would love to receive a 7qt Le Creuset dutch oven for Christmas. I love the Pear Tree Blue Fabric Bundle! What a great store - thanks! Oooooh I love the Black and White bundle, 4 Fat Quarters - sweet!!! Thanks! I am hoping to get a lap top! !